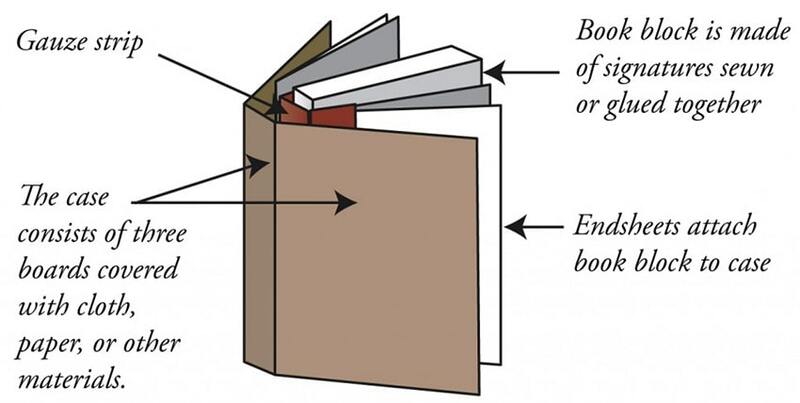 What is involved in Hardcover Book Binding? The steps involved will vary a bit depending on the machine brand and model that you are working with, but these general overviews will give you a good idea for how the processes work. Step one for hard cover book binding is called thread sewing, and is the process where your book pages are actually sewn together with a needle and thread. Typically pages are folded together into booklets called "signatures" and then those signatures are sewn together. This can be accomplished by hand for those making their own hard cover books, or using an automated machine for print and finishing shops. After sewn together, the book blocks are trimmed to be flush. Thread sewing is not required for all hard cover books, and is primarily used for novels. Thinner books, such as for photo book binding, will often skip this step and simply glue the signatures together. Step two for case binding is to make the case (or the hard cover) itself. To do this, you can use any number of machines, or do it by hand with some patience and skill. It involves printing your wrap-around cover page, and then adhering it to chipboards to create a hard cover. With a machine like the Casematic, lining up the 3 boards and your printed cover, and then wrapping the corners is fast and accurate. Step three is to bind the two pieces together, finishing your hard cover book. This process involves a special binding glue that is heated up and applied to the book block spine, and then pressing the spine into your cover. Sometimes a gauze/fabric sctrip is also applied. An end sheet is also used on the first and last pages of your book to attach the book block to the covers more thoroughly, as well as hide the inside of the boards from your case. Here at Binding101, we offer hard cover book binding machines specifically for the photobook industry (rather than publishing). This skips the sewing step, and goes straight to the case making and binding of your book block. The photo book binding process is simpler than you may imagine, though the machines can look a little intimidating to someone new to the idea. Just click here to see the photobook binding machines and supplies that we offer, and start making premium-quality photobooks for your prints shop or photography studio today.